Despite Uneven Results, Alzheimer's Research Suggests A Path For Treatment : Shots - Health News The year saw some disappointments in the development of drugs to treat Alzheimer's. But the setbacks were offset by progress in other areas. The upshot from this year's mixed results, some scientists say, is that treatment for Alzheimer's needs to start long before forgetfulness and muddled thinking are apparent. It's been a mixed year for Alzheimer's research. Some promising drugs failed to stop or even slow the disease. But researchers also found reasons to think that treatments can work if they just start sooner. Scientists who study Alzheimer's say they aren't discouraged by the drug failures. "I actually think it was a phenomenal year for research," says Bill Rebeck, a brain scientist at Georgetown University. Rebeck is optimistic because during the year, several very different lines of research all began to suggest a new way of thinking about Alzheimer's — that it has to be stopped before it damages the brain. "Once you start to lose a lot of synapses, once you start to lose a lot of neurons, your brain can't recover from that," Rebeck says. "And so when we start with people who have symptoms of the disease, treating them turns out to be unsuccessful." That explanation comes in part from studies that used a new research tool approved by the Food and Drug Administration in April. The tool is a drug called Amyvid that's injected into the bloodstream and travels to amyloid plaques in the brain. Those are the plaques associated with Alzheimer's. 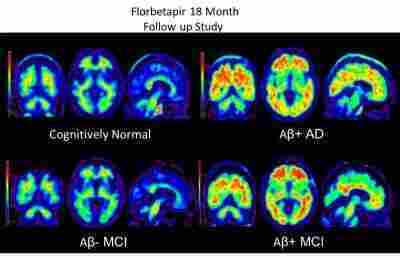 The dye, also called florbetapir, lets researchers detect even tiny plaques using a positron emission tomography, or PET, scanner. "In the PET scan you can see whether somebody has amyloid in their brain...before [they show] symptoms of the disease. I think that's huge," Rebeck says. Researchers have already used the technique to show that amyloid begins to build up decades before people start having problems with memory or thinking. Rebeck says it should also provide a much quicker way to gauge whether a new Alzheimer's treatment is working. Another advance this year was a study showing that the brain begins to function differently long before symptoms of Alzheimer's appear. Lori Beason-Held of the National Institute on Aging presented the study at the Society for Neuroscience meeting. She says previous research had found brain changes among people in the early stages of Alzheimer's. "Our study has gone back even further and discovered changes in the brain that occur up to 11 years before any symptoms occur in individuals who eventually become cognitively impaired," says Beason-Held. And the changes probably start even earlier, she says. That might sound discouraging, but Rebeck doesn't see it that way. "What that says is there's an opportunity, there's a window when if we could stop that amyloid from accumulating, or start to clear it out of the brain, then you could prevent those symptoms from actually ever happening," he says. Another study this year suggests a way to do that. Researchers in Iceland discovered that families with a rare gene mutation are much less likely to get Alzheimer's. The mutation appears to interrupt a key step in the formation of amyloid. In order to form amyloid, the brain has to first cut up a larger molecule, explains Robert Vassar of Northwestern University. That step requires an enzyme called beta-secretase or BACE 1. "BACE 1 is like a pair of molecular scissors, and what the mutation does is sort of interfere with the way the molecular scissors can cut. It sort of like, dulls the blades," Vassar says. Just a few months ago researchers came up with a drug that does the same thing that the gene mutation does naturally, says Rebeck. This drug, though, may have to be administered before amyloid has begun to build up. Michael Raffi, of the University of California, San Diego, says the new thinking about amyloid and Alzheimer's is a bit like the current approach to cholesterol and heart disease. Doctors don't wait until someone has a heart attack before putting them on drug that lowers cholesterol. "Really the ideal situation is to have checked their cholesterol levels 15 years prior, and seen whether it was elevated, which would imply that they have an elevated risk of having the heart attack, and starting the medication then," Raffi says. It's still not clear, though, whether amyloid is the new cholesterol. "It took a long time for us to make that connection between cholesterol and heart disease," says Rebeck. "That's been very successful. It's been very helpful in so many people's lives. We're just [at] earlier stages in studying Alzheimer's disease."